Fast acting rust and stain remover. Available in smaller spray bottle. Rust Free removes rust and stains on steel, cast iron, fiberglass, chrome, tile, porcelain, and vinyl. This fast-acting rust removal product removes rust from areas that are impractical to soak in rust removal solutions. To use, just wet the surface and allow it to penetrate for up to a minute and then wipe dry. If the area is heavily rusted, repeat process and use an abrasive pad to remove the rust. If any rust remains just repeat process until it is completely free of rust. 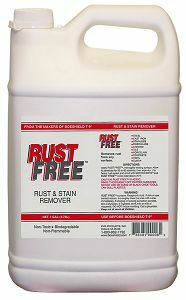 The bulk gallon quantity of Rust Free is available for situations when larger surfaces need to be de-rusted. Rust Free is non-toxic and biodegradable.